After a brief mid-Summer break, we’re back and once again have rotated around to our original flagship series. In the last installment we checked out one of Romania’s unsung supporter communities of the early ’80s, in Universitatea Craiova and their fixture with Hajduk Split in 1983. 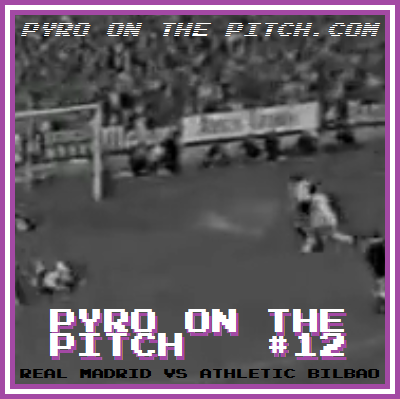 Now we are going to revisit an encounter that we touched on back in Pyro On The Pitch #9: – Anderlecht vs Real Madrid 1984, while talking about the latter’s immediate prior history. In 1920 Madrid FC were given the title “Real” by King Alfonso XIII of Spain, as an officially dubbed royal club of the kingdom. Having been formed 18 years earlier after a split from a university team, they would go on to represent one of Europe’s great capital cities and become the favoured team of Spanish dictator Franco, who restored the “Real” title after it had been stripped during the years of the Second Spanish Republic, along with the crown on the club’s crest. On the pitch Real were officially a continental powerhouse since the 1950s when the European Cup began. Success in this competition was appropriate, as the club’s president from 1943-1978, Santiago Bernabéu Yeste, was one of the three men to organise the start of the Cup for UEFA in 1955. Considering all this, it is no wonder that the club became hugely supported and to house this support was also one of Europe’s biggest stadiums. In that same year of 1955, their Nuevo Estadio Chamartín was renamed to Santiago Bernabéu by the club’s board in honour of their chairman and was expanded from 75,000 capacity to a mammoth 125,000 (over-crowded to nearly 130,000 for a visit of Milan the following year, the ground’s record attendance). Some of the record breaking 129,690 supporters in the freshly redeveloped Bernabéu, Real Madrid vs AC Milan, European Cup semi-final, 1956. With their history of royalist-fasicst connections, it is also not surprising that the club’s support base swings to the right. In contrast, Madrid rivals Athletico were formed by Basque students as a feeder club for Athletic Bilbao, who’s Basque-only player policy marks them as a de-facto separatist Pays Basque team in the Spanish league, although there is a strong right-element in the Atheltico Madird support also. 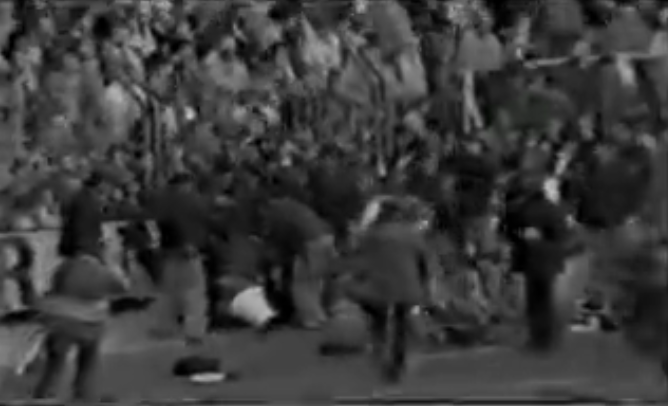 By 1980, the movement of organised young supporter units that had been spreading in Europe reached Spain and Read Madrid’s Ultras Sur were formed. The group were based in the stadium’s South Stand terraces (sur of course meaning south), but rabid, colourful support was common on all sides of the massive ground. An especially large attendance was of course most guaranteed for big European ties. Home fans celebrate a goal in what would be a 3-0 victory, Real Madrid vs Glasgow Celtic, European Cup quarter final, 1980.0. 100,000 in the Bernabéu for the visit of Spartak Moscow, European Cup 80/81. 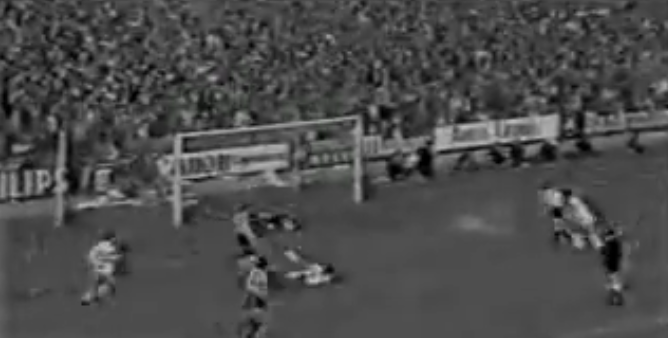 A respectable crowd of 65,000 even came to see Real effectively play themselves in the 1980 Cope Del Rey final, also in the Bernabéu, when amazingly they ended up against their B-team Real Madrid Castilla. Unsurprisingly the A-team won 6-1, but hopefully there were a handful of hipster types disgusted by Madrid’s success who staunchly supported Castilla only, akin to a modern wrestling fan preferring NXT over WWE. Real Madrid vs Castilla, Copa Del Rey final, 1980. There would be a crowd of nearly twice that of the cup final for the following seasons visit of Internazionale – a slightly more challenging European Cup semi. 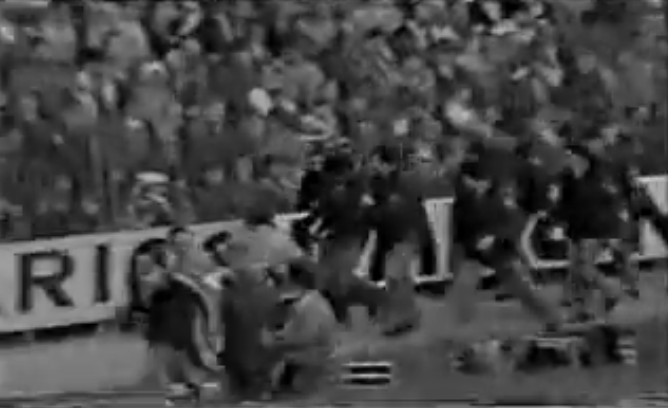 En route to a 2-0 victory that would help win the tie (ultimately followed by defeat to Liverpool in the final), the home players could be seen scaling the pitch-side fence and saluting the packed Ultras Sur enclosure. 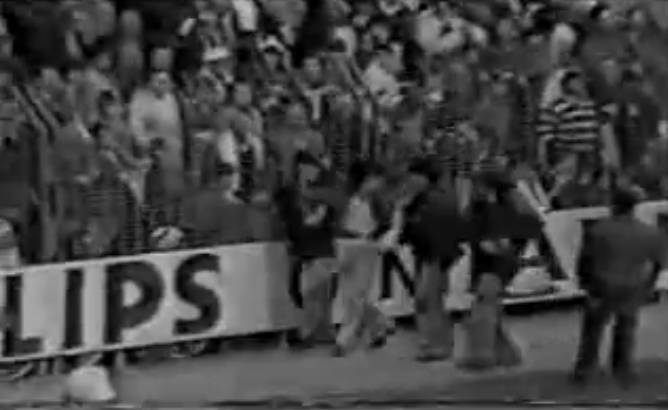 Players celebrate a goal at the South Stand, Real Madrid vs Internazionale, European Cup semi final 1981. 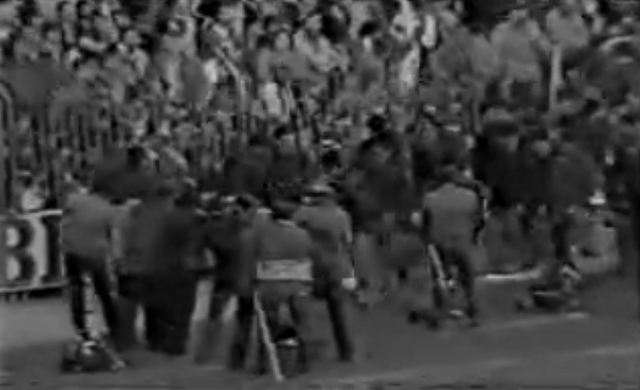 As mentioned, other areas of the ground were also home to passionate supporters. 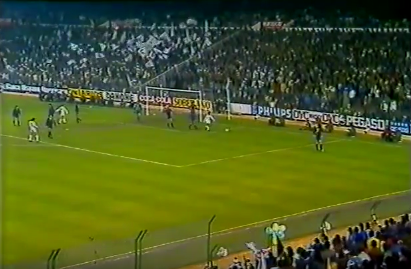 A particular section at the opposite end to the ultras and to the left of a dividing fence in the terrace was often eye catching as a sea of waving flags. But Ultras Sur, with their overtly right-wing leanings, had arrived as the dominant group at the in the stadium and would soon make their presence felt on the pitch as well as in the stands. 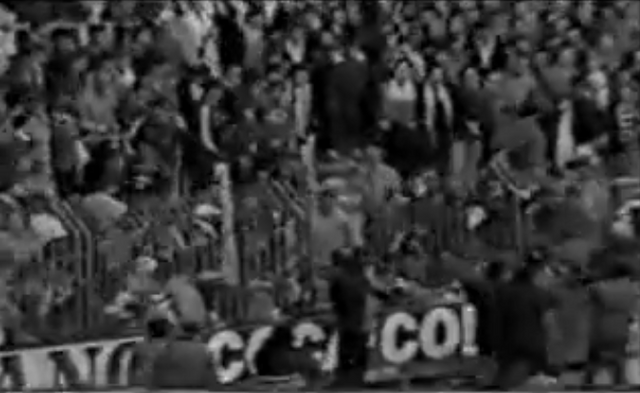 Home support in the North Stand enclosure, Real Madrid vs Barcelona, Primera División 83/84. 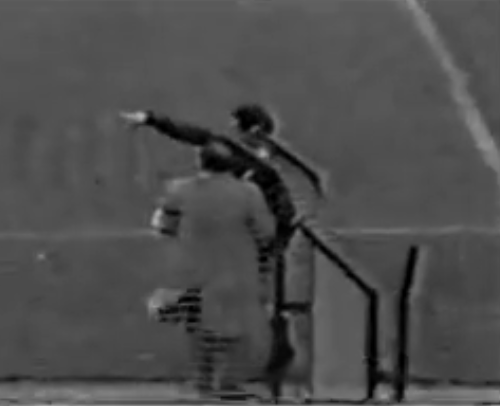 The apparent earliest evidence of Ultras Sur’s ire being directed towards the pitch would feature the visit of the aforementioned Basques of Athletic Bilbao, now long divorced from Real’s crosstown rivals. By the time the two were to meet in a November 1983 league encounter, the Bernabéu stadium had been redeveloped again for the 1982 World Cup and as a result had it’s capacity reduced to “only” 98,000, and then 85,000 for the 83/84 season. Today we bore more than yesterday but less than tomorrow. 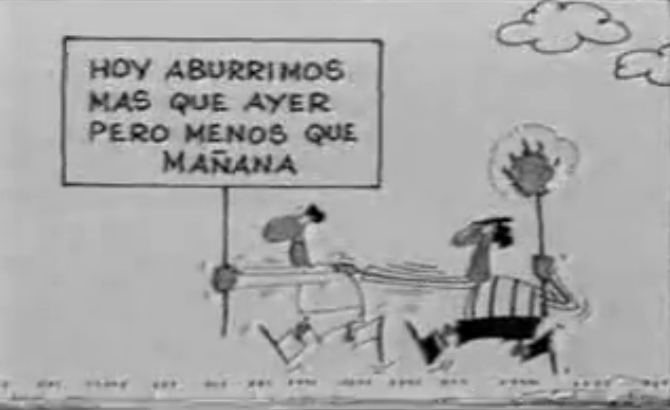 The announcer of the footage possibly gives an explanation for the action as part of a protest of some sort, but unfortunately as we are not fluent in Spanish this is more of a guess. However if you do understand what is being said, please get in touch! Those of you paying attention earlier will have noticed that the report opened with a spoiler that the match ended 0-0. It would be one of many instances of dropped points for Real Madrid that season that would ultimately cost them cruelly, as Athletic Bilbao took their second consecutive championship only by goal difference. But what may have hurt most for the capital city club was that including Real Sociedad’s two title wins at the start of the decade, it was the fourth year in a row that the title went to a Basque side since Real Madrid themselves had last won it in 1980.